Cassette not stored in a case upon arrival, and case added on 09/05/14. 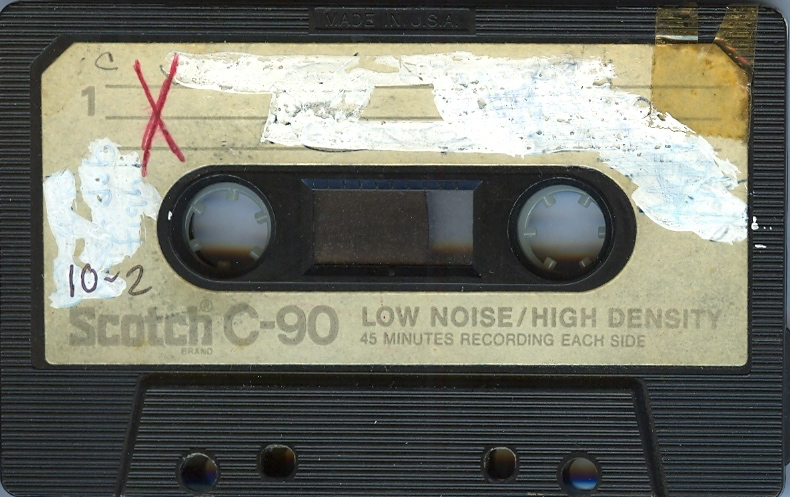 Scotch brand C-90 “LOW NOISE/HIGH DENSITY” cassette. Erasure safety tabs had been removed, but there was yellowed Scotch tape over the Side 2 tab-hole. This was removed on 03-06-15. Upper left, there is a letter “c”, probably in Debbie’s handwriting. 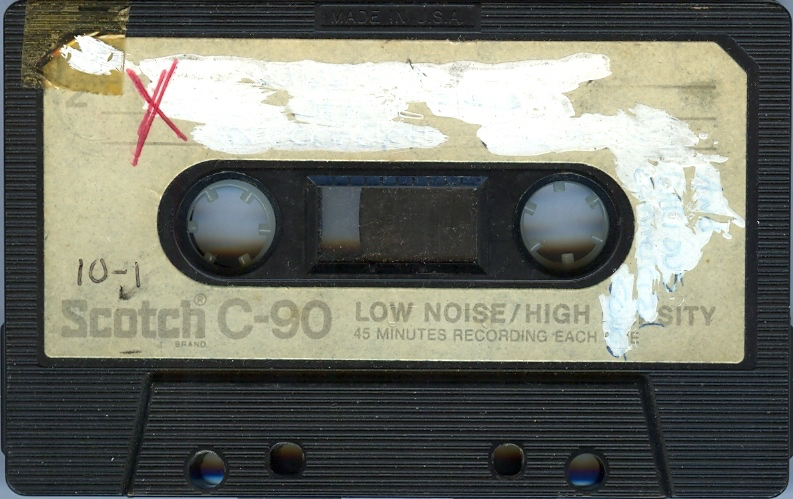 Previous writing on cassette has been covered up using white-out. Upper left there is a big red “X”. Lower left, in Hal’s handwriting, in black ink, “10-2”. Previous writing on cassette has been covered up using white-out. Upper left there is a big red “X”. Lower left, in Hal’s handwriting, in black ink, “10-1”. 00:30 - 04:09 - A stereo recording, synthesizer tones -- probably VL-Tone in both channels. 04:10 - 05:09 - A stereo recording, synthesizer tones -- probably VL-Tone in both channels. vinyl record compilation. This was probably previously recorded on the tape, and the Jaffe & McGee recordings at the beginning of the side of the tape were recorded over the song “Give Peace A Chance” and the first four minutes of “Cold Turkey”. 00:06 - 06:01 - Stereo recording (probably/possibly multi-tracked): sounds like Casio MT-11 keyboard, maybe Dr. Rhythm drum machine, and maybe a Casio VL-1. This is probably a Hal composition because it’s very splattery and plinky-plonky-plunky. 06:02 - Stereo dub from an unidentified vinyl record album of keyboard music, maybe a library record?... It sounds kind of “20th Century avant garde Classical”. My guess is that this was recorded on the tape previous to the Hal keyboard mess at the beginning of the side of tape. - The second piece heard from the album sounds like xylophones or marimba or some other kind of mallet-struck tuned percussion. This makes me wonder if perhaps it is a Steve Reich record? Are there any Harry Partch records recorded in stereo? Varèse? Subotnick? Babbitt? Needle sets back down at 18:55. Reed wind instrument(s) (clarinet? oboe?) and maybe tuned percussion? The tuned percussion sounds kind of have an “electronic” sound to them. The piece at about 30:00 includes female vocals (Joan La Barbara? ), in addition to the previous instrumentation. Also string bass… At about 36:55 a male voice interjects. The voices sound “American”. At 40:51 we hear what sounds like a recording from radio, including (ick) “Lady” by Styx. After that, BLANK until end of the side of tape at about 45:45.